I've hardly finished any products this month! There's a few which are nearly finished but these three are the only one's that are completely empty. 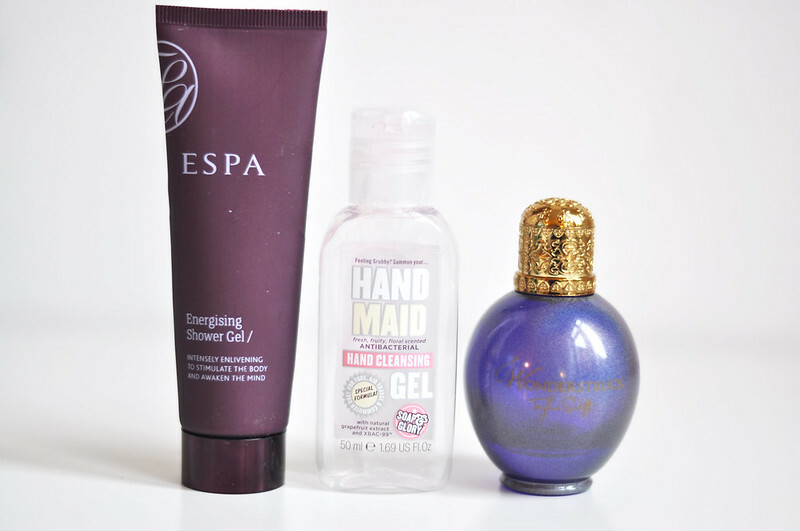 Espa Energising Shower Gel* - This shower gel came in the Espa Glossybox and I really enjoyed using it. It felt a lot more luxurious than normal shower gels and it lathered really nicely. I also loved the spa scent. I have another mini tube of this to use up and I've love to buy the full size but it's £18 which I can't really justify. Soap And Glory Hand Maid - This is an essential for work and I've already started my next bottle. I do wish they'd sell it in a bigger size so I can keep one on my desk though. Taylor Swift Wonderstruck Perfume - I can't believe I've gone through this perfume so quickly but I have been wearing it everyday since I got it. I love the scent and you can read my proper review here. I will be buying this again at some point. I also want to try out Taylor Swifts new perfume. the perfume bottle looks pretty!